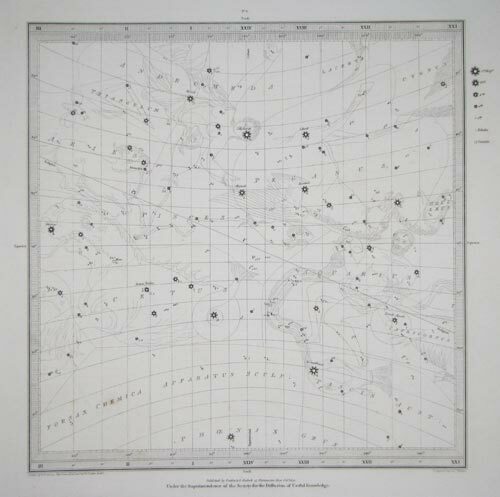 Lee Jackson Maps - Set of Six Celestial Maps. London: Baldwin & Cradock, 1830. 6 steel engravings, printed area c.310 x 330mm. With titlepage and 2pp. descriptive text. Occasional spots. A detailed set of celestial charts on the Gnomic Projection, projected on the map in perspective. Thus the sheets form a rough cube. Each star is marked with its apparent magnitude and is shown within its classical constellation. The text contains an extensive quote from Flamsteed discussing his research on the originators of these constellations.